she is a white leghorn. she is a crazy free-spirited spunky little one. she is not to be caged in. she will get out of her habitat. it used to be just once a day. struts around, then flies over the other side, and explores the yard. i used to have to catch her and guide her back in. she is not to be caught. nor is she guided back in if she isn't ready yet. 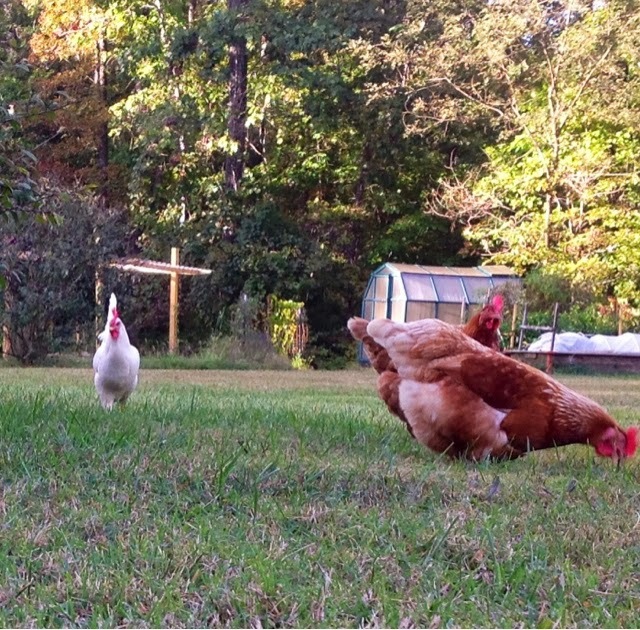 recently she figured out how to get back inside the chicken habitat all by herself. she finds just the right spot, flies back up, then jumps back over on the other side. i am so very thankful she has figured it out. it makes me worry about her less. since this has happened, we have seen her out and about the yard at least 4 times a day. brain keeps an eye on her. we watch her, too, if we are at home. it is way better than tv. and one day I will have some pictures capturing this crazy event.